Who-ville was an Imperial-controlled planet on the distant edges of the Goatronium Expansions. The indigenous population of Whos were renowned for their kerplinkas and what-woozlers, Christmas carols, and delicious roast beast. Neither they, nor the local Imperial garrison, was expecting much trouble. 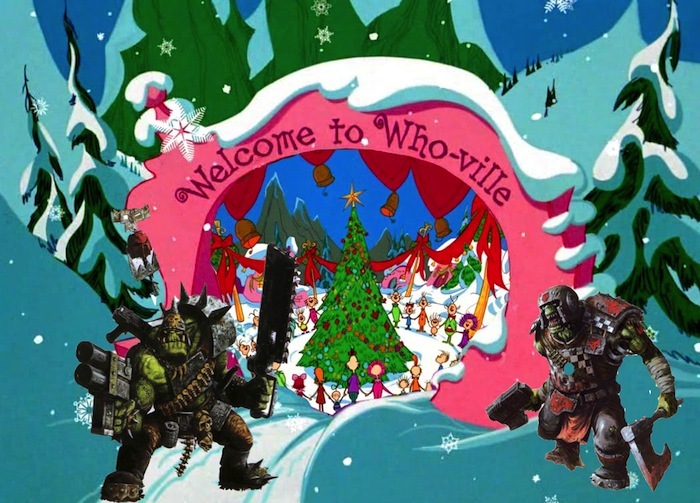 However, on top of near by Mount Crumpit—ten thousand feet up—lived a mean old Ork warboss—da Grinch— who HATED Christmas. The Grinch was referring to the Imperial tradition of singing carols around the tree on Christmas morning. The Whos would sing in joyous celebration of Christmas, while the Guard would sing in fearful terror of the punishments inflicted by their commissars on those who failed to show anything less than the required degree of apparent enthusiasm. 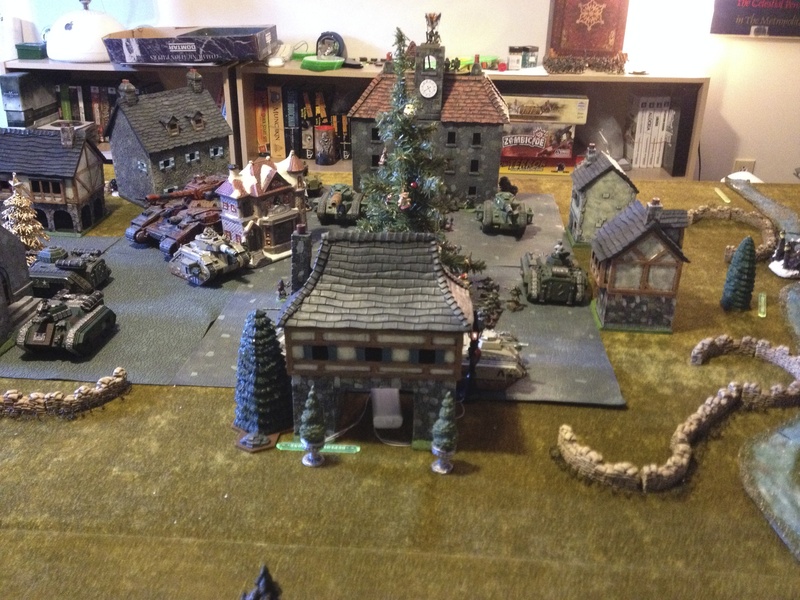 The town’s defences included several platoons of infantry, heavy weapons squads, a Banebalde super-heavy tank, three Leman Russ tanks, four lighter Chimeras or Hellhounds, and artillery. 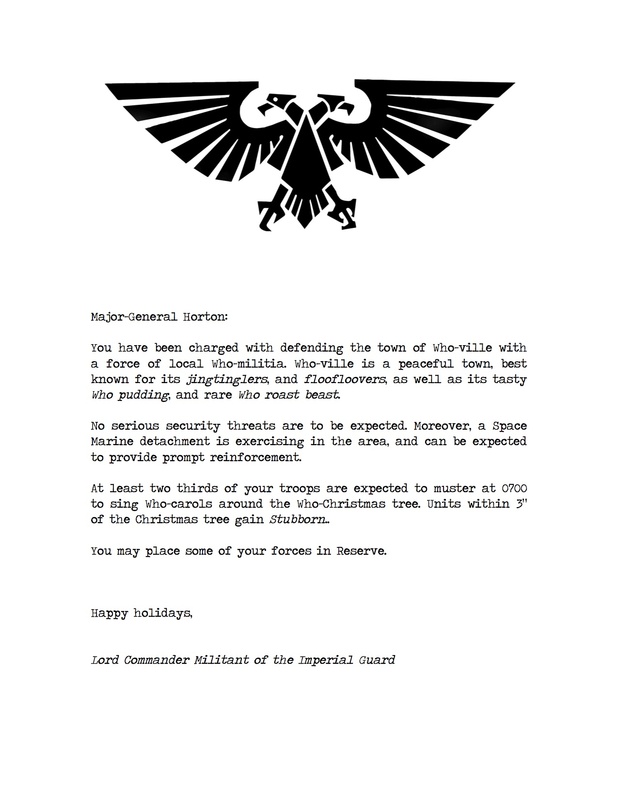 Additional Space Marine reinforcements could also be quickly called upon from nearby, or from orbit above the planet. Attacking from the west was mad scientist Dr. Morork, his fearsome Stompa, and his fanatical army of Meks and Grots. Grots on hover-boards led the way! Other Grots hurried to set up a battery of Lobbas behind a copse of trees. 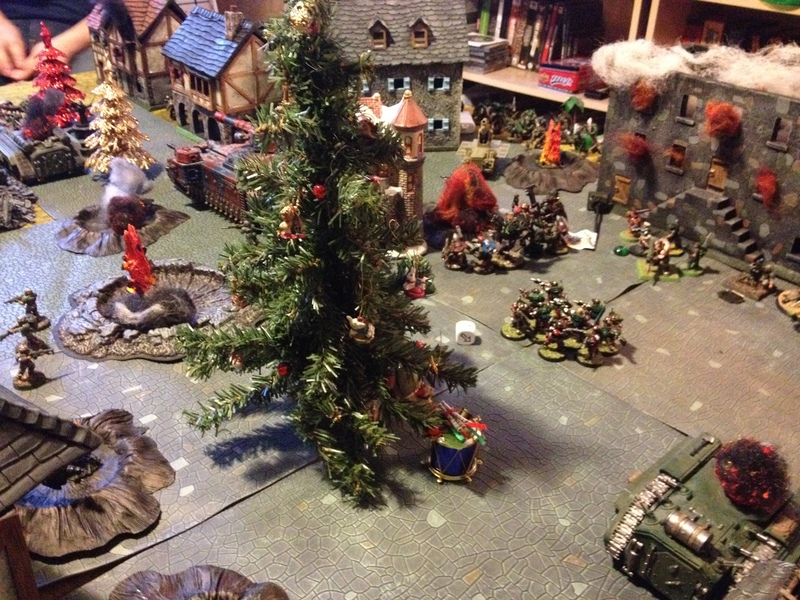 This would soon bring deadly fire down on the Imperial Guard in the town as they scrambled from carol-singing around the Christmas tree to their assigned defensive positions. 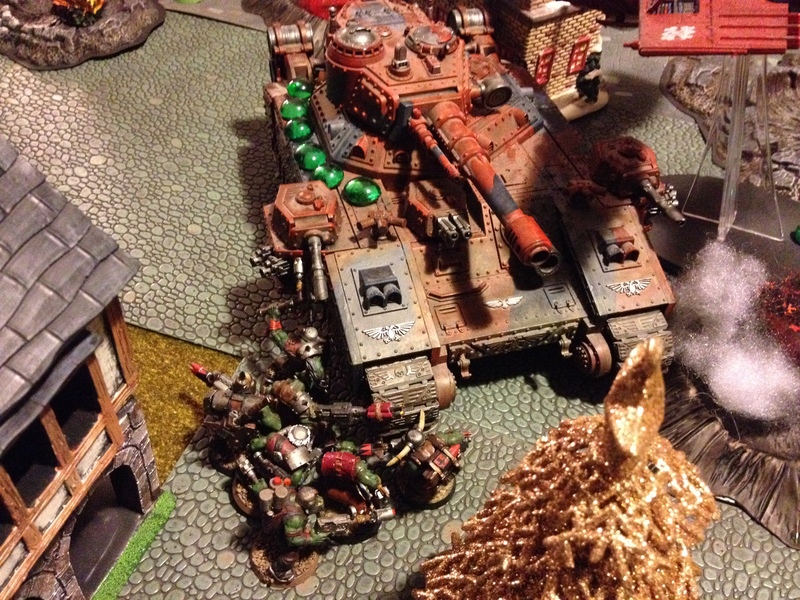 From the east, Warboss Maxx led four huge mobs of Choppa and Shoota Boyz through the sleeping streets of Who-ville. He could also call upon a unit of Tankbustas to strengthen his main assault, Boss Snikrot and his Kommandos infiltrating from the rear, and Boss Zagstruck and da Vultcha Boyz arriving by deep-strike. From the north, down the very slopes of Mount Crumpit, would come da Grinch and his mechanized troops: a Battlewagon, Looted Wagon (with Boomgun), two mobs of ‘Ard Boyz in Trukks, Buggies, Deffkoptas, and a few Lootas. A Dakkajet and Blitzbommer would provide air support. 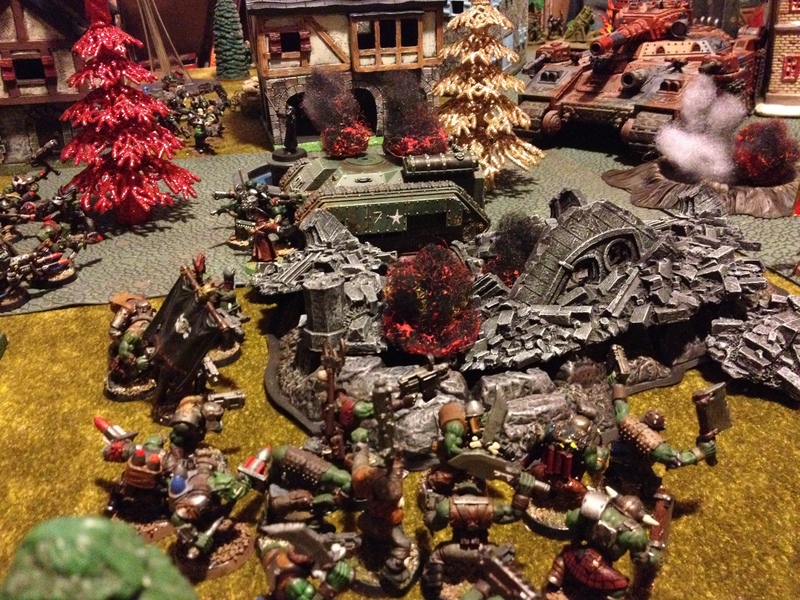 Cunning as ever, da Grinch himself planned to flank march with a squad of Meganobz in a Trukk, hoping thereby to catch any Space Marine reinforcements by surprise. Under the cover of night, Warboss Maxx’s boyz started their infiltration of the town. 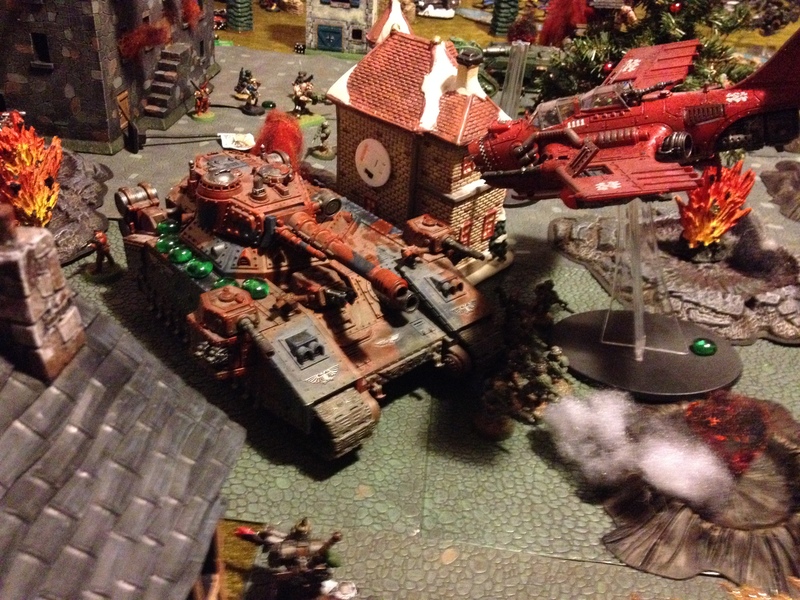 Not even the sight of a Baneblade in the town square deterred them. 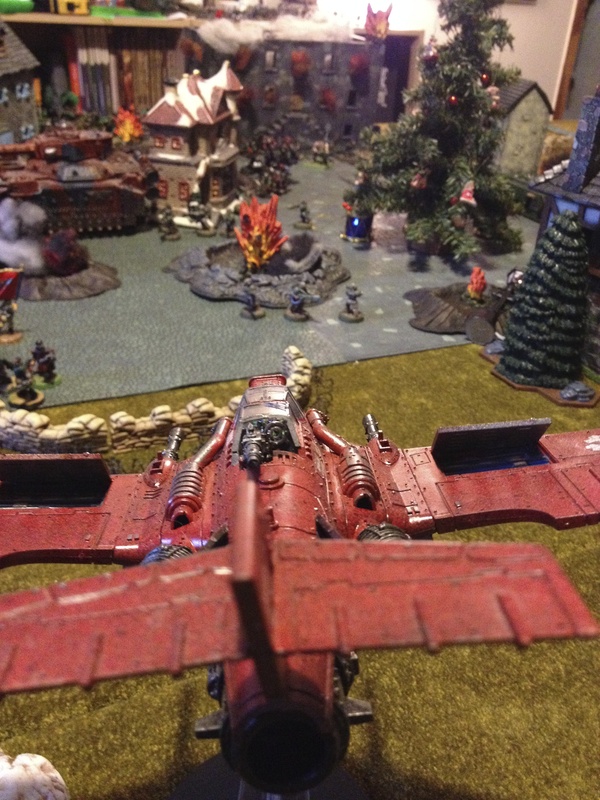 As dawn broke, the greenskin air force roared into the attack. Dakka-dakka-dakka-dakka-dakka! 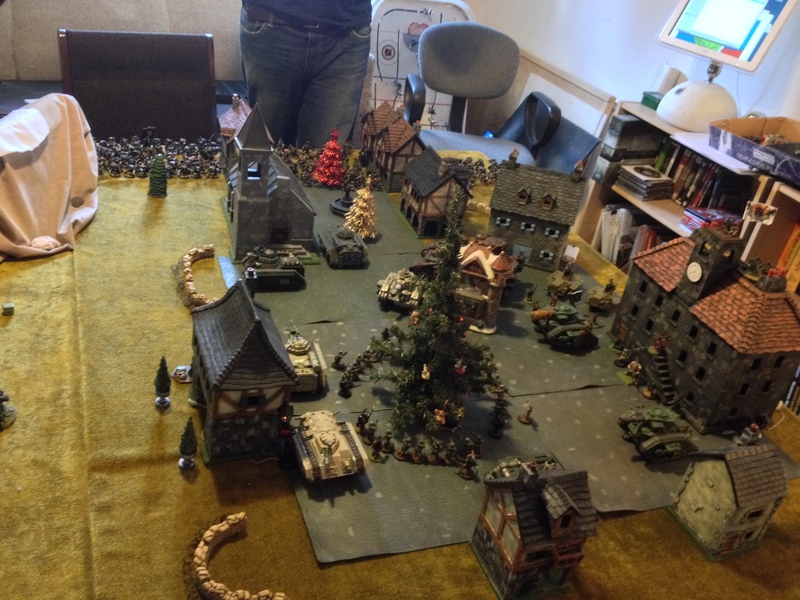 This, together with the fire from the Stompa, Looted Wagon, and Deffkoptas, took out some of the Imperial armour (much to the relief of Warboss Maxx, who was worried about his boyz being roasted by the Hellhounds). 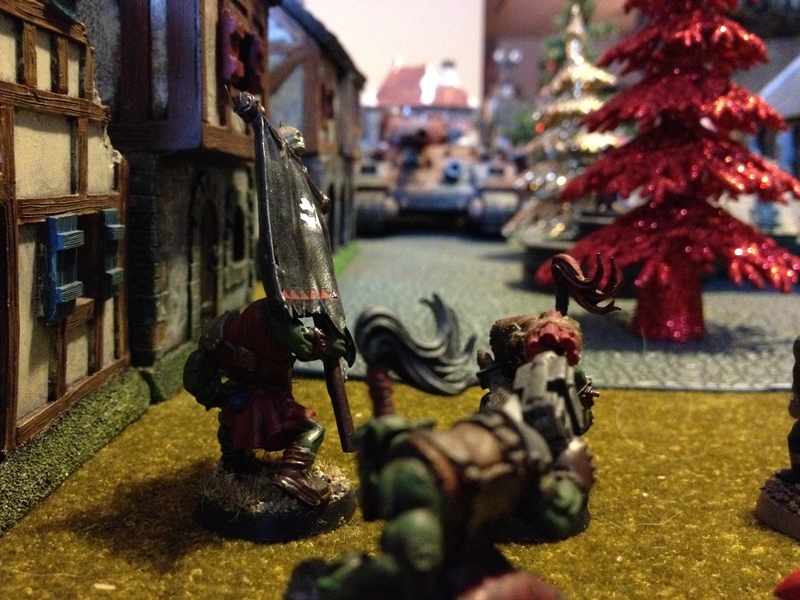 Shortly thereafter the Ork Stormboyz and Kommandos launched their attack in the Imperial rear, as suppa-rokkits from the Stompa destroyed the town hall. The former took out a tank and the Imperial artillery, while several squads (and much of the Imperial headquarters) were lost in the latter. 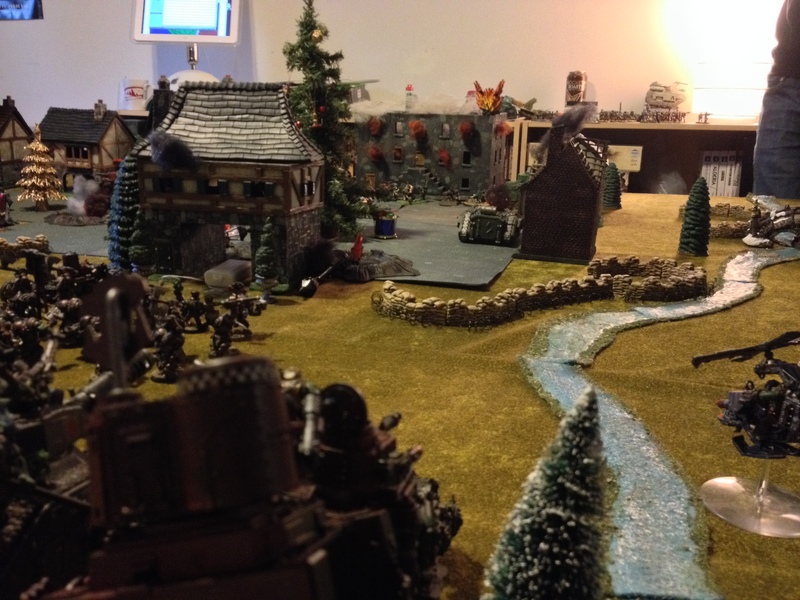 Imperial heavy weapons in the toy shop, a squad of veterans, and the sole surviving Leman Rus gunned down first da Vultcha Boyz then the last of the Kommandoes. 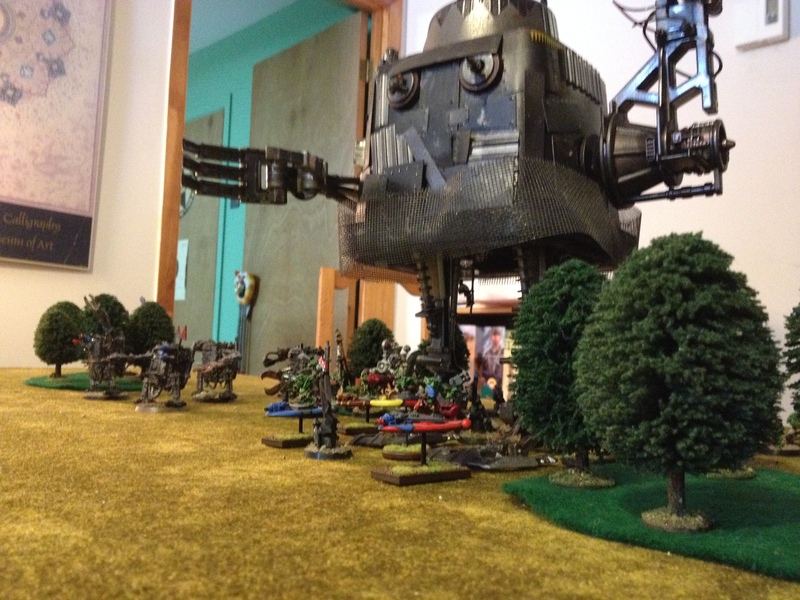 Meanwhile, the Ork mechanized forces began to approach the northern edge of Who-ville. They lost several Trukks and Buggies to Imperial fire, however. The ‘Ard Boyz crawled out of the wreckage of their transports and began to foot-slog towards their objectives. To the west, Maxx’s boyz suffered heavy casualties from the Baneblade, but took out a Chimera and tore down St. Seuss cathedral on top of several squads of Imperial infantry and heavy weapons. The few human survivors from St. Seuss fell back towards the square. 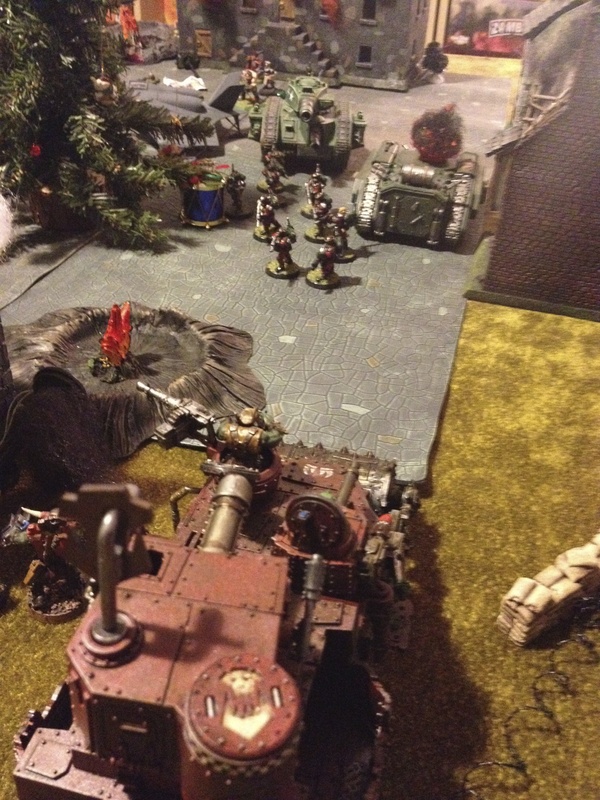 The Tankbustas charged the Baneblade. They were soon wiped out, but not before inflicting some serious damage on the super-heavy vehicle. Space Marine reinforcements were surprisingly slow in arriving. Those that appeared in the town were immediately slaughtered by a mob of Choppa Boyz, and their Rhino torn apart with a power-klaw. 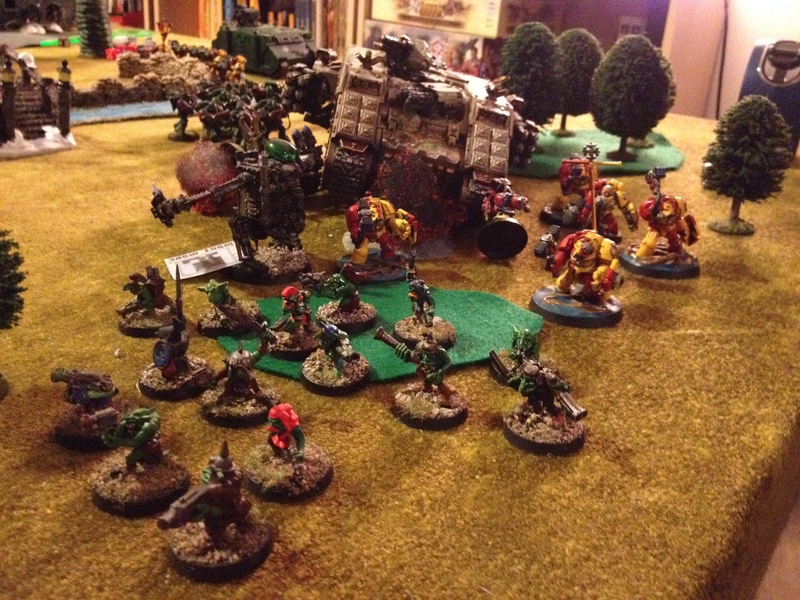 A Marine Land Raider and a squad of Terminators arrived on the eastern flank, intent on taking down Dr. Morork’s giant Stompa. 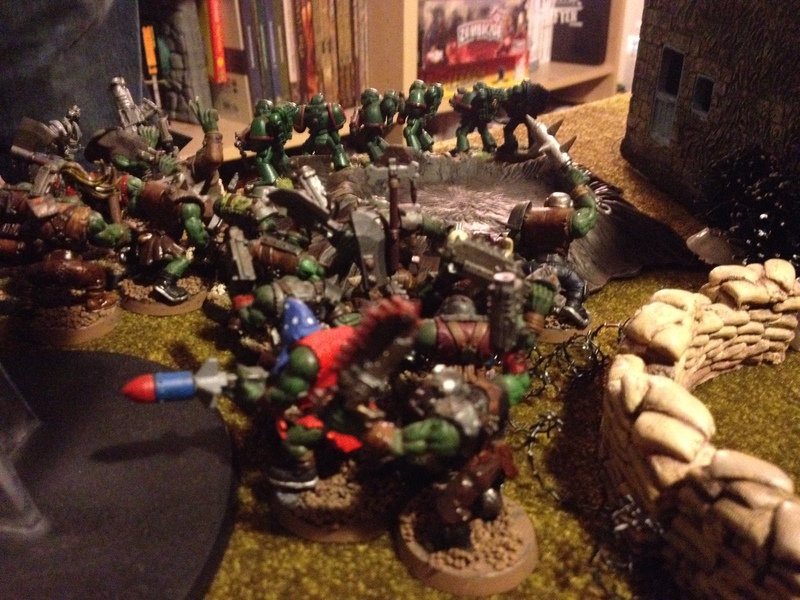 First, however, they had to cut their way through the many Grots defending it. This proved surprisingly hard to do—although one unit of Grots was quickly routed, their defensive fire shot down two of the Terminators in the process. 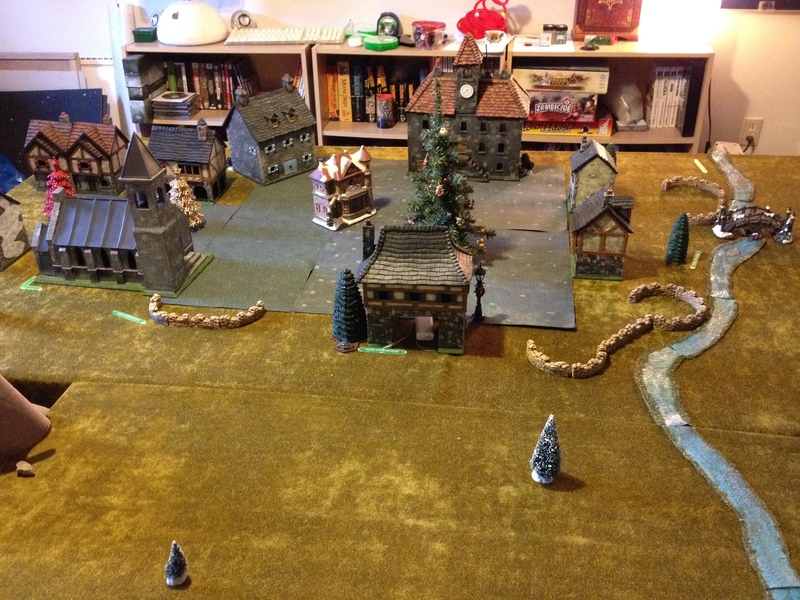 As the Grots scampered, they squeaked insults at the Marines. 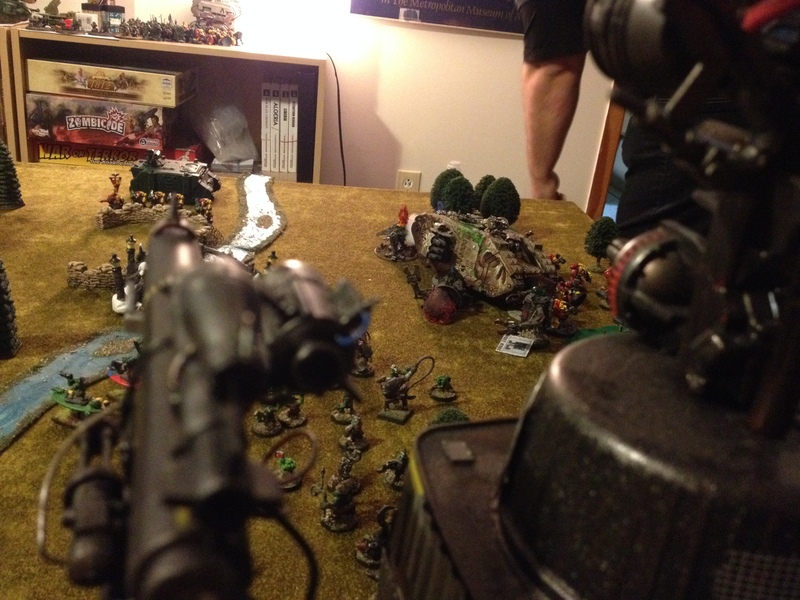 A second squad of Marines with missile launchers took up position in the distance, and fired upon the Stompa. While they did some damage, the Meks inside seemed to fix any damage almost as quickly as it was inflicted. 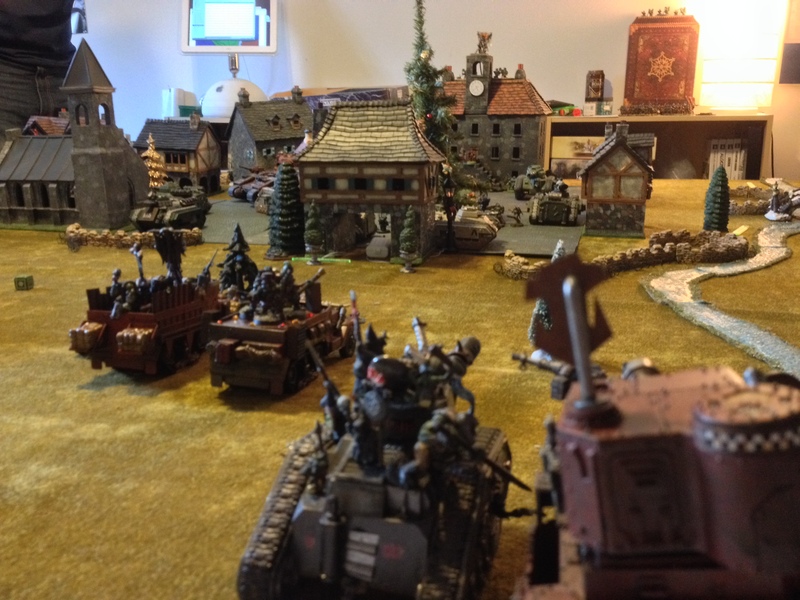 A Leman Russ and a platoon of infantry hurried across the square to meet the Battlewagon and other Orky vehicles as they entered the town. Would the Imperial tank destroy its Orky opponent before it could use its fearsome deffroller on the defenders? We’ll never know. 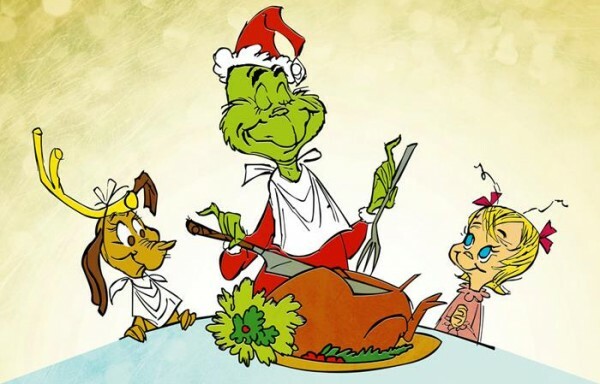 For at this point, the Whos down in Who-ville, the tall and the small, invited everyone to join them in a feast of delicious Who-pudding, and rare Who-roast beast. The battle was therefore called a draw.